Member of a Manehattanite aristocratic house, he is Ambassador for a foreign adoptive sandlandic nation called Deerham. Ashti is a moderated pony, realist but open-minded. He could seems distant toward others due to his nearly serious, reserved and indisposed to parties which not make it especially friendly. He's a genuine good-hearted pony, and have a benevolent behaviour towards others. He is mature, conciliatory, sociable, well-mannered and respectful to everyone without exception of race or social status. He keeps a permanent neutral thin smile to seems less cold. He also speaks in a calm voice and mostly with neutral tone, sometimes warm, but rarely angry or stressed. He's cool-headed and also patriotic towards Deerham - but not fanatic -, and proud of his lineage. For him, everyone is responsible for its own actions and must take their responsibilities. Indeed, he condemns the unjustified and exceptionable violences. He works for of peace with his tact and diplomacy as only weapons. He have the hard task to avoid misunderstandings that could have serious consequences on his homeland. Ashti is the son of aristocrats from Manehattan. At the age of 7 years old, he and his parents were coming to visit his godfather Salim. but in route, They was surprised by a powerful sandstorm. His godfather, Salim, worried to not see them come, decided to venture into the desert with a few volunteers: they found Ashti, unconscious, his parents, themselves, were go missing. Salim, a exiled magnate and diplomat pegasus, then raised his godson as his own in the nobility and taught him several matters, including the language of the city-state. Since his childhood, Ashti has always lived in Deerham, a City-State with a majority of deer/antelope/gazelle and very few equines. Over the years, he became a gentleman. 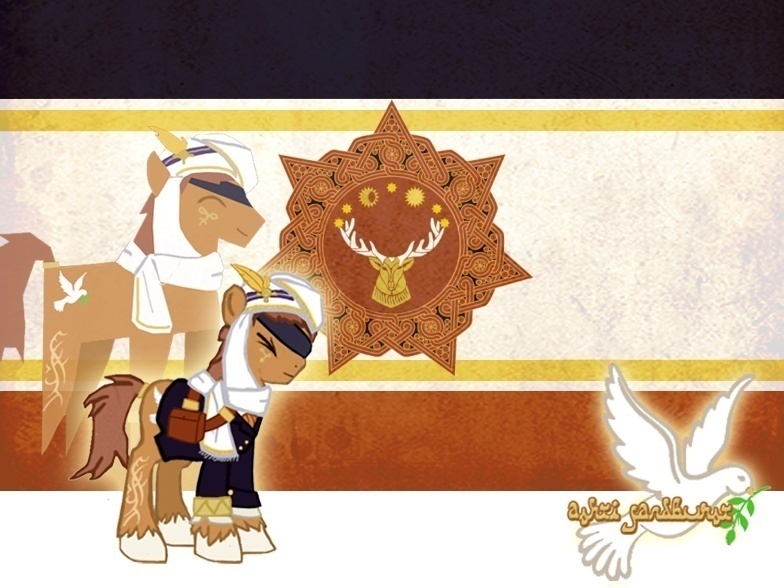 And one day, He received his cutie mark, in settling a conflict, through diplomacy (trying to emulate his godfather). Seeing that he had some skill, and at the request of Ashti, Salim decided to complete his training as a mediator. And, by self-taught, Ashti decided to learn the language of Equestria. Some year later, an new sovereign take the power, and proposed to strengthen diplomatic and commercial links with the external spheres of influences, like Manehattan, Canterlot or Cloudsdale. Salim, friend of the new ruler, wanted to do the travel, but the ruler decided he was too old to traveling and indispensable to the city. Salim then proposed to the king, Ashti as herald of the city. He was a unicorn, mature, gifted in diplomacy, know the language of Equestria, and was logic choice. symbol of his new status. His mission begin in six months, during which time he took the opportunity to study the customs and geography of Equestria. Six months passed and so he left his house, ready for his long and difficult mission. During his job in Equestria, the Unicorn have encountered many dangers which have reinforced his mental but also friends. In the verge of death he developed a ability called Clairvoyance and also a super form, the Apotheosis Form. And recently he have defeated a godlike entity in saving his nation and became the Hero of Deerham along with Arabesque that he married some months ago. He has also recently take in an orphan, Finder, which he made his brother. In his homeland he wears sandlandic cloths, but in Questrian he have a turban, His ambassador's suit (including a waiscoat) is a haute couture's outfit tailor-made by a Manehattan's couturier, and of course done with expensive materials. Ashti always caring with him a little first aid box, which contains : painkiller, bandages, band-aid, ointments and disinfectant. We don't know what could happen. My MLP main oc used for rp.